This past weekend I helped host a baby shower for my sweet cousin who is expecting her first child, a baby girl, on Christmas! She has picked out some beautiful things for a nursery in gray and white with pops of pale pink. 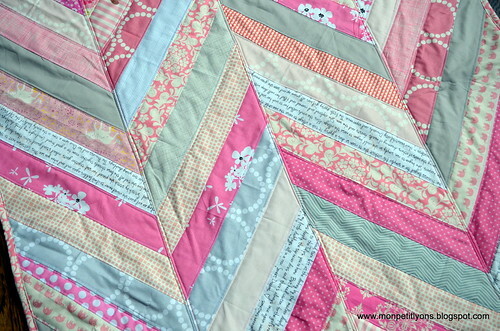 I wanted to make a quilt in those colors and decided to use Maureen Cracknell's Herringbone Quilt tutorial. Since we have used a small square baby quilt so much for Sean, I wanted to make the same size so it could be used as a mat for the baby to play on. I changed the dimensions of the panels in Maureen's tutorial to 9.5" x 36" and just made 4 of them to end up with a 36" square quilt. I loved this method and hope to make a larger one someday! Although it probably wasn't the best match I have been dying for an excuse to buy some of the Alexander Henry print Princess Kingdom from his Once Upon a Time line forever! I love these little princesses and the dragons and castles! I also made a fabric bin (much like the one in this tutorial, but in pink, of course!) but completely forgot to photograph it because it was so last minute! I hope to be back in this space soon, I have so much to show you, just never time to get on the computer! A Christmas baby! 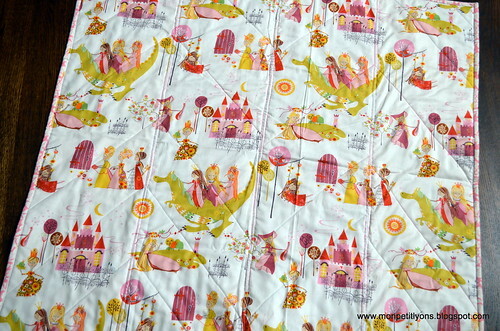 I love the quilt - I never seem to get one done in time for a baby shower. That print makes a great quilt back! Wow! I think the AH fabric makes a great back! The front is stunning! 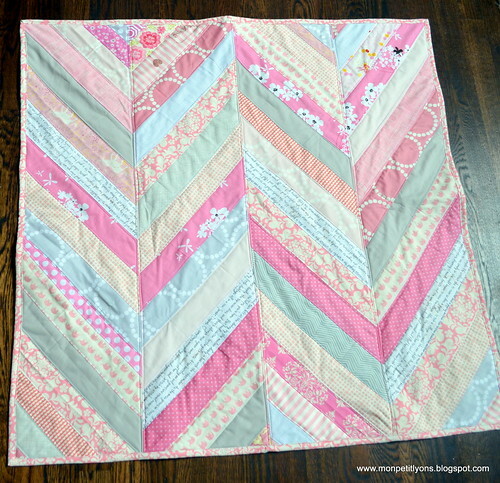 This quilt is quite a stunner! I really love the pinks, and how it's such a wonderful variety of pinks and greys. It's so beautiful!